This is the first review from a new guest reviewer - Scott Turnbull. Not only did he do a nice job on the write up, he did a marvelous job on the photos. Take it away, Scott! This is my first offering as a guest reviewer at Michael's place, though I have done informal online reviews via various newsgroups and discussion boards. 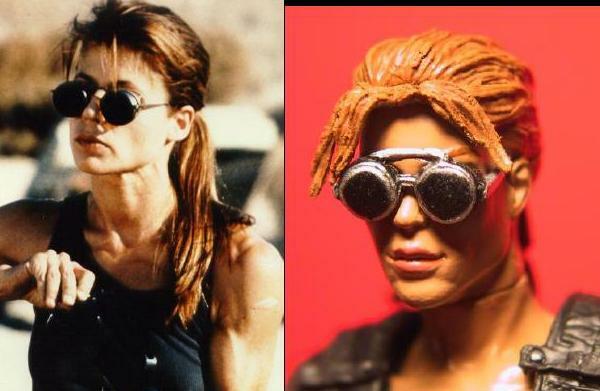 already been reviewed here, but not the counterpart figure, Sarah Connor. 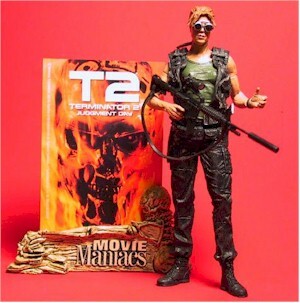 I present to you McFarlane's Movie Maniacs Series 5 Sarah Connor from Terminator 2, Judgment Day. securely twistied to that carrier with no less than 5 wires. Other accessories are taped into their respective cubby holes. Work work work. 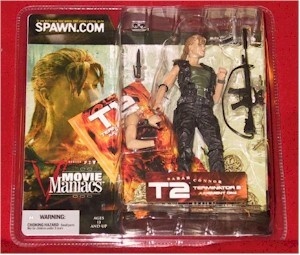 McFarlane is making me earn my bits of fun. there. 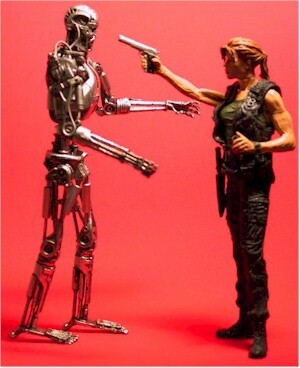 One nice feature is that this figure stands a good head shorter than the companion T-800 Endoskeleton. This is in keeping with the relative sizes of the characters in the movie. extreme closeup (thanks to a 3MPixel Macro image) there is some clumping on the surface. This is barely noticeable with the naked (40 something) eye. There's a collection of accessories that accompanies Sarah. She's got a slide action handgun (with an overly long barrel), a sniper rifle with scope, silencer, and rubbery sling, a combat knife, and her trademark round sunglasses. I find the rifle to be a bit spindly looking, but perhaps I'm just used to looking at the oversized ones packaged with 1:6 figures. Sarah's hands for handling the rifle. 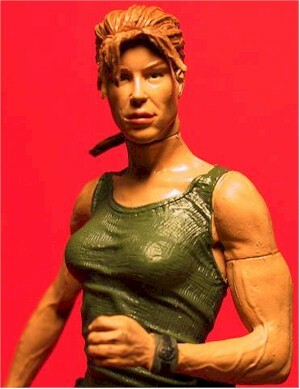 Sarah also comes with a spare right arm with alternate pose, and a spare left hand with alternate grip. More about those later. The final accessories are the two part movie poster stand and printed card mini-movie-poster. My stand went together only after applying a lot of pressure. I suspect it would never come apart again. The mini poster is taped to the inside of the product packaging, and some card backing was lost when peeling off the tape. The poster does display well in the stand. I'd like to note that there appears to be a variation on this figure that includes a ball cap instead of the flowing hair. I don't know whether that cap is removable, or not, as I didn't pick up that figure at the Spencer's store that I saw it in. 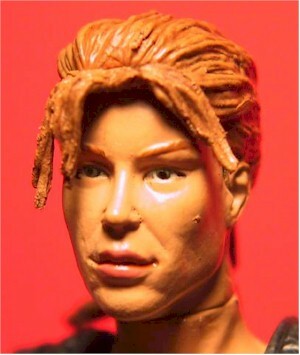 EDITOR'S NOTE - there are three Sarah versions - pony tail with hat, pony tail without hat, and long hair. The articulation on this figure consists of neck swivel, shoulder cuts, bicep cuts, wrist cuts, waist cut, thigh cuts, and ankle cuts. That's 12 joints by my count. There's a alternately posed spare left hand and right arm, so that ought to up the score somehow. The bicep cut joints are in a portion of the arm that doesn't have a circular cross section, so the joint is fairly obvious when rotated from the neutral position. 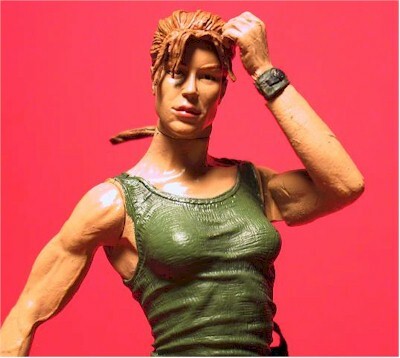 The extended right arm doesn't have a biceps cut joint. 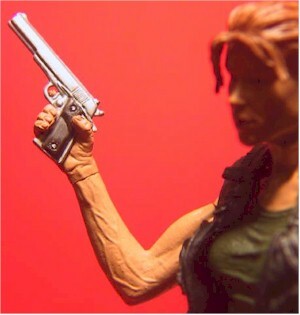 The right hand is well sculpted to hold the pistol, but the left hand variation with the circular grip doesn't seem to match any of the accessories. Unless she's holding the barrel of the pistol, which would be an odd thing to grab hold of. The combination of waist, thigh, and ankle cut angles allows the figure to be posed with feet close together or splayed apart. This figure would need a hip and knee joints to allow a kneeling position to rate a "4" for me. 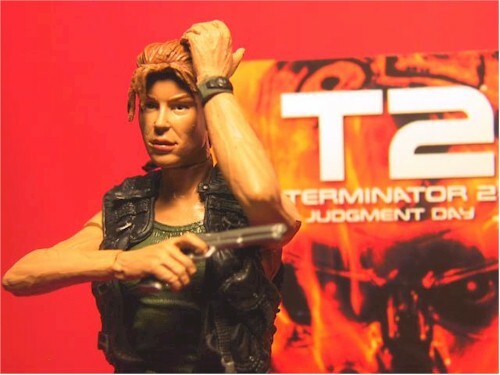 I feel this figure is a nice blend of articulation, sculpt, and accessories, and displays well along with the companion T-800 Endoskeleton figure. I particularly like the detail on the vest, though the figure also displays well with just the underlying tank top. 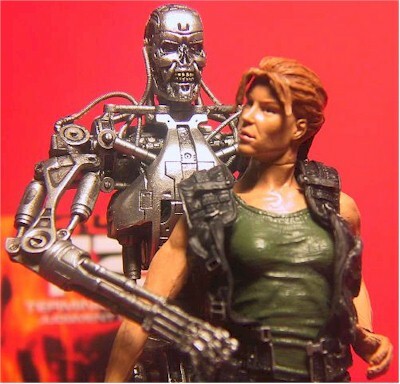 Without a doubt, the best accessory for this figure is the companion T-800 Endoskeleton figure, available as a separate purchase. - Action Figure Express has a great deal by the case at $90 plus shipping. That's only $7.50 each plus shipping! Just search for 'movie maniacs'. (MROTW Affiliate). 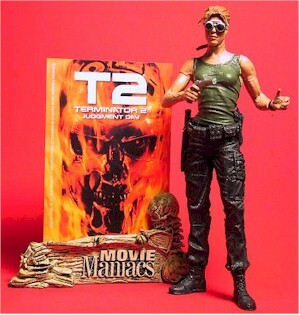 - Entertainment Earth has a case of 12 for $115, which is just $9.58 (plus shipping). Only problem is findind someone to take the extras off your hands! (MROTW Affiliate). Scott Turnbull is a computer systems engineer who has been obtaining and playing with his toys since the mid-60s. Few survived his curiosity and prying tools, but the memories of toys gone by live on.